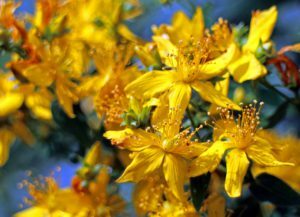 What is the best St.John’s Wort Supplement? Do you want to know what is the best St. John’s wort supplement? How can it help you with stress management? Nowadays stress is everywhere and we need to do something about it, because stress is the one that can destroy everything that we hold dear: our relationships, happiness, and our health. Sometimes herbal remedies can help us with stress or anxiety relief. Here you can find five St. Johns Wort supplements from Amazon bestseller list. 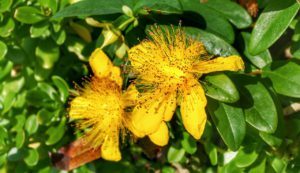 St. John’s Wort (Hypericum perforatum) is a plant that grows in the wild and has been used for depression and anxiety that chronic stress can cause. It traditionally helped to relieve the symptoms of mild anxiety and slightly low mood. It is a wild flowering herb with beautiful distinctive yellow blooms that look full of sunshine and strength. But maybe these plants are fallen star from the sky giving as healing and beauty. Look at these beautiful star-shaped yellow flowers and tell me what else can you see? The leaves and petals contain many unique substances such as hyperforin and hypericin, and I guess they are what makes this herb so special. Some studies suggest that St. John’s Wort is great for depression-related anxiety, but there is more research required how this herb can help with anxiety and stress relief. It is believed that St. John’s Wort has antioxidant, analgesic, antimicrobial and wound healing properties. This herb is also used to treat bruises, neuralgia, and swelling. Description: This is maximum strength St. John’s Wort extract. Each tablet is packed to maintain its potency and freshness. This supplement has been registered under the Traditional Herbal Registration Scheme (THRS) in the European Union. Ingredients: 425mg of extract (as dry extract) from St John’s Wort aerial parts (Hypericum perforatum L.) Extraction solvent: Ethanol 60%v|v. The manufacturer said that they “committed to improving people’s health and well-being and do so using only the finest plant-based, natural healthcare products”. Description: This St. John’s Wort supplement is manufactured in the United Kingdom. This product has been shown to meet the required standard of safety and quality and is assessed by MHRA. Description: This traditional herbal supplement is made in the United Kingdom. Each tablet provides 300 mg of St. John’s Wort extract, and you can use it to reduce stress by relieving low mood and mild anxiety. Ingredients: Each film-coated tablet contains 300mg of extract (as dry extract) from St John’s Wort aerial parts (Hypericum perforatum L.), maltodextrin, silica colloidal anhydrous; (tablet core) calcium hydrogen phosphate dihydrate, hydroxypropylmethyl cellulose, cellulose microcrystalline, silica colloidal hydrated, croscarmellose sodium, magnesium stearate; (tablet coating) sodium carboxymethylcellulose, dextrose monohydrate, sodium citrate, lecithin, dextrin. Doesn’t contain artificial colors or flavors. Description: This St. John’s Wort supplement is a traditional herbal medicinal product that is used to relieve symptoms of mild anxiety and slightly low mood. This can help to reduce stress because we all know that anxiety or bad mood usually are symptoms of stress. Each tablet contains 334 mg of St. John’s Wort extract. The plants are harvested manually from the wild in Chile (July, August) and then dried in the sun. 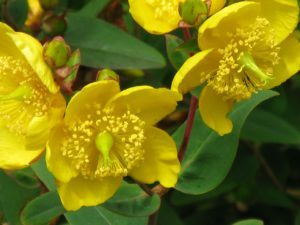 What Is The Best St. John’s Wort Supplement? This is a good question, but it’s not always to say for sure, because we all are different and with different needs. The same supplement can be great for me, but not for you. However, there are things that can you can look for and things that you need to avoid if possible, but as I said, everything depends on you. After reading many reviews about these St. John’s Wort supplements, I am convinced that they all aren’t the best ones and in my opinion, they are bad for your health and well-being, because there are too many unnecessary things in them (filling, anti-caking agents, preservatives, magnesium stearate etc.). If you don’t have a real choice, take them after consulting with your doctor. However, in my opinion, all of these supplements are better than taking antidepressants or some anti-anxiety medication that can cause addiction. The supplement below is the best one because it’s pure St. John’s Wort without any more ingredients and somehow it reminds me of home, of childhood when we selected this herb for our tea. Description: This dried St. John’s Wort can be used as a tea for stress and anxiety relief and you may experience other health benefits. There aren’t any cons that I can see, but of course, it’s better not to drink this tea every day for a long period of time. There are other great teas that can help you with stress and anxiety relief. St. John’s Wort is a special herb that you can use for anxiety, depression and stress relief. What Is the best St. John’s Wort Supplement for you? What do you think about these supplements? Did you use it before? Let me know below! Are you looking for the best St. John’s Wort supplement? CLICK HERE for more information.